The ABC7 I-Team investigates heartbreaking complaints about sick puppies. 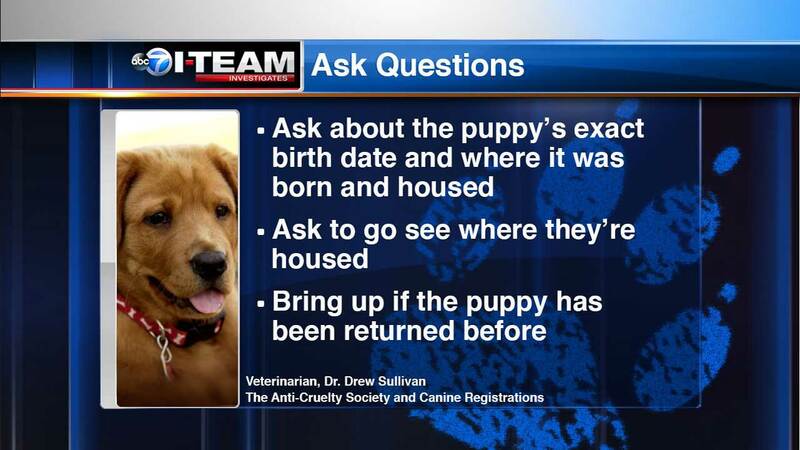 CHICAGO (WLS) -- The I-Team investigates heartbreaking complaints about sick puppies. Customers say dogs they purchased from a local pet store chain were either ill or died shortly after the purchase. We found that some puppies at pet stores are coming from breeders which had recent problems on their inspection reports. The I-Team started following the paper trail after hearing about complaints from store customers, about sick - and in some cases dead - dogs. Breeders and veterinarians say before you fall head over heels for that puppy in the window, you should ask where the dog came from, and other important questions. They're cute, cuddly and can cost thousands of dollars: purebred pups and designer dogs found at area Furry Babies pet stores. Evelyn Rodriguez and her daughter fell in love with a 3-month-old Morkie at the Bloomingdale location. "She kept going 'when is he coming home, when is he coming home?' and I had to tell her, you know, 'the puppy is in heaven,'" Evelyn Rodriguez said. Buddy was put to sleep in mid-July, three weeks after the purchase. "I mean it was horrible. They put the dog to sleep," Rodriguez said. According to the vet report, Buddy's X-rays showed evidence of a slightly enlarged heart and the puppy had problems breathing. An autopsy showed a "severe pulmonary hemorrhage" throughout half the lung and that it could have been from a "congenital abnormality" affecting the heart. "He was in a lot of pain," Rodriguez said. Rodriguez believes she deserves a refund under the puppy lemon law, which says a customer is entitled to a remedy if a puppy dies from a congenital or hereditary condition within a year of the sale. She's currently working with a manager to potentially get a refund. A lawsuit was filed in 2013 against Furry Babies Incorporated and the president, Roger Trolinger of Rockford, Ill., alleging that it sold sick and mistreated puppies that were born and raised in filthy conditions to five families. The lawsuit said one of those families was sold a puppy which passed away shortly after the purchase. All are demanding refunds. In its legal response, Furry Babies' attorneys have denied all of the allegations of wrongdoing. Dina Burdi bought a Shih-Poo named Gioia from Furry Babies in Bloomingdale. She says she didn't pay attention to health records which disclosed that the puppy had a common parasite when it was sold to her on December 24. It's legal to sell a sick dog in Illinois if the illness isn't severely impacting the animal's health, and one test showed Gioia was negative for the infection two days after the purchase. But Burdi turned to a new vet after continued "vomiting, coughing and diarrhea." Gioia's test results on January 6 were again positive for parasites. She's on medication and on the road to recovery. "The doctors said, 'Oh, she's so tiny." It was getting me worried that she wasn't going to make it," Burdi said. "If something happens to her, I don't know what I will do." And there was this "findings of fact " from 2010: the Illinois Department of Agriculture issuing a fine, saying a sick puppy was sold at the Bloomingdale location. We also took pictures of several Furry Babies' breeder certificates, which legally have to be displayed. Then, we entered the breeder license numbers in the USDA website and found these inspection reports from different breeders nationwide: dogs with ear mites, open sores, swollen gums, scabs, excessively long toe nails, reports of a mass on the paws of a dog, expired medications, accumulation of waste, dog feeders with an excessive buildup of bird feces on the top of them and growths on the eyes, near the eyes, infections in their mouths." We showed the reports to Susan Olsen of the International Kennel Club. Even though breeders were found compliant in follow up reports, she's still skeptical. When ABC7's Jason Knowles asked her, "Would you want to get a dog from one of those breeders?" Olsen replied, "I would not." After leaving several phone messages and a note at his door in Rockford, Roger Trolinger of Furry Babies said he would talk on camera, but then canceled and issued this statement: "The puppies that are featured in this story were all certified as healthy when they were sold. They were each examined and cleared by two veterinarians." He says that's the case with all of his puppies which are also covered by an "excellent warranty." But Rodriguez says she is still on the hook for $2,000 financed through Furry Babies. "I'm still paying for this, I don't have that puppy, it was very heart breaking for our entire family," Rodriguez said. The International Kennel Club in Chicago says if you go to a pet store, first research the breeder to make sure its recent inspections check out, get health records directly through the breeder and ask about the health record of the puppy's parents. And take your puppy to a trusted vet within the first 48 hours of purchase. If there is a problem, ask a vet if you qualify for restitution under the puppy lemon law. There is a pet shop ordinance now in Chicago which says pet stores can now only sell dogs, cats and rabbits purchased from an animal shelter - but that is being challenged in a lawsuit.